Ever wondered how chocolate is made? Learn (and taste!) 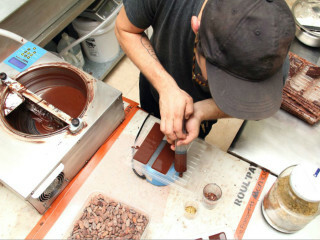 how cacao is transformed into chocolate with SRSLY Chocolate's own Bob Williamson. Watch as cacao beans are cracked, winnowed and refined into chocolate. Discover the basics, ask some questions and go home with a bar of fine craft chocolate.